When I was asked to write Sewing for Dummies, I was thrilled and…I’ll admit it…flattered. As part of the Dummies author group I rub elbows with experts on everything. Computer geeks of the tallest order like Andy Rathbone, Windows for Dummies (15 million books in print), to famous coaches — Notre Dame University’s Richard “Digger” Phelps, Basketball for Dummies. But as I revel in that warm momentary glow, reality slaps me in the face as potential readers – sewers with years of experience tell me they are put-off by the title. After all, they don’t consider themselves “dummies” and figure that a book like this is for beginners – which it is – and it isn’t. So let me clear this up. The Dummies formula is familiar to readers – a great resource presented with a sense of humor that breaks down a topic into bite-sized pieces. And here’s the good news for readers who sew. Whether beginner or experienced – each chapter and each topic within each chapter is written as a standalone. So you don’t need to read anything before or after that chapter or topic to understand it. How do you use this in your everyday sewing projects? As you work through your next project and your next step is to sew a dart, edgestitch that pocket, or insert a zipper, flip to the topic in the book and see how I suggest you do it. My hope is that you’ll read my words, hear my voice and find a better, easier way to get the job done. Keep the book next to you as you sew, make notes in the margin – use it to your heart’s content. When you do, I hope that you, treasured reader, will understand that “Dummy” is a term of endearment. The great thing about sewing is that you can, as they say on American Idol, “make it your own”. In the denim purse , an old pair of jeans, Coats Jeans Zippers and Coats Jeans thread created the look. But change the fabric to a fantastic Amy Butler print and solid, coordinating colors of Coats All-purpose zippers and Dual Duty XP Multi-color threads and you have a total makeover! 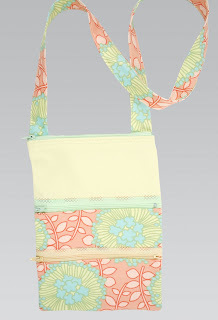 This purse is a free download, just in time for your summer travels! Thread color depends on the look you are after-and there are so many options-342 of them in Dual Duty XP alone!! Choose a bright color for contrast. Or select a heavy thread like Dual Duty XP Heavy or Coats Jeans thread for bold, prominent stitching. Working with a print? Select a color closest to the predominant color. For solids, a slightly darker shade blends best, because it will appear a little lighter when sewn in. So, break out that favorite pattern and sew it up again. This time you can whip it up oh so much faster, and get set for summer with some wonderful print fabrics. Amy Butler is a fab friend of DIYStyle. See what she has been up to…….she’s one busy (and talented) lady! It’s been an incredible summer! The season has been full of many exciting launches and loads of new product development. This is one of my favorite times of year! My gardens explode and I love watching the drama unfold before my eyes, it brings me so much joy, I love hanging in the garden in the evening at the end of a long day. The Lotus bog is soothing and if feels wonderful to be surrounded by lush plants in bloom. All the hard work in the spring nurturing the beds really pays off! I was able to extend my “August experience” this year with the launch of my newest home decor collection of prints for Rowan…. “August Fields”. The collection is made up of four diverse color stories celebrating the inspiration of gardens and wild fields in high season. Everything peaks in August! Poetic combinations of elegant natural prints and modern textures make it easy to mix and match designs for your next home dec or fashion project. Here’s a sneak peak below with some fun shots of my AF photo shoot last weekend at my friend Brian’s house! I’m using AF for everything! Bedding, pillows, bags, ( of course right?! ) and clothing. My friends here at DIY Style will appreciate the fashion focus with this collection! I’ve made tons of beautiful garments. Check out some of the shots. In the first shot above my friend Andrew captures Jesse in one of my new dress designs! And his beautiful shots follow! Drenda is wearing on original necklace made by my dear friend Kim Mettee. You have to check out her Etsy shop…… amazing, crazy cool jewelry. She uses rare materials and gems to create her organic and spirited masterpieces. Thank you Kim! I love to work alongside my friends and loved ones, it makes the creative process even more thrilling and rewarding. Here’s Mr. Butler caught red handed in one of my sets! We had an incredible day of shooting. Just the night before he had a rock and roll show with his band the Black Owls! I don’t know how he looks so rested…….. he’s my Dave! Here are my friends Christina and Nichole shot by Mr. Butler just a few minutes later. The girls are wearing my new apron design made out of August Fields! Here’s the props room with all the details and goodies to embellish my girlfriends. I’ve staged all of the props and accessories by color stories….. of course! Everything on hand to style my ladies! The details in and of themselves tell a beautiful story! Color explosions everywhere! I love it!! Another long awaited addition to my fabric mix has also launched this summer! Amy Butler Solids. The material is beautifully woven with a gorgeous feel, my solids come in both home dec and quilting weights to coordinate with all of my print collections with Rowan. The pretty colors will enhance and compliment any project and are sure to stir your creative passions! I have a fun mix of projects on my web site that feature both the home dec and quilting weight collections. I also have a great free quilt pattern you can try……. I named the quilt after my friend Thea, she’s a wild creative fire! I just love her. You can grab the project as a download under my “free patterns” section on the site. This month I will be introducing my newest quilting and fashion weight collection for Rowan. The line is called Daisy Chain and it is embellished with artistic flourishes that give a nod to our free spirited past! Daisy Chain is filled with earthy chic prints with a modern folk feel that harmonize in the four zen like color palettes. These romantic prints are perfect for fashion, home dec or quilting projects. I had a blast creating several fashion pieces to show off the range! It’s the best when all of my worlds collide…… color, prints and fashion. Building the story with my style shoots is one of my favorite things to do. This shoot we invited our friend Andrew Baasch to take some pics with Dave. The results are amazing! You’ll have to check back on my web site soon to see all the gorgeous inspirado! Enjoy!! Drenda above models my Angel Dress and Christina is styling in her Daisy Chain head scarf, lounging on my new Daisy Chain quilt. The quilt will be a FREE pattern on my web site soon! I can’t get over the color of her eyes and how she blends so beautifully with the navy DC palette! These shots were captured by Dave…….. gorgeous Mr. B! One of my most recent product launches featured my new GIFTWRAP GREEN collection with the Giftwrap Company. The line is made from 100% post-consumer recycled paper and is printed with soy inks. The line includes gift wrap, bags, and giftcard boxes. I’m very proud of this partnership with the Giftwrap Company, we worked very hard to create an ecologically sound line. It’s incredible to be able to offer a green alternative to gift giving and entertaining. Alongside the gift wrap & bags, we’ve developed an eco line of paper tableware (plates, napkins & guest towels) that coordinate. The plates and napkins are printed with 100% soy ink, plus the plates use a water-soluble coating so that they can be rinsed and recycled too! I had my family for the 4th of July and it was great to rinse the plates and then toss them in the recycle bin. The plates are very sturdy as well as stylish! The perfect combo! Here are a couple of my favorite projects……. the Cheeky Monkey Laundry Bag and the Sleepy Snail with removable Shell Pillow. The other detail I love about the book is that I rated the projects by difficulty level so you can ease right into a project that’s perfect for you. This is a keeper! A great book to keep on hand for gift giving! I wanted to give you a little peek at my upcoming December launch of Midwest Modern 2! This small release includes brand new prints to compliment Midwest Mod 1. Here are a few shots from my camera that I took during our shoot at Brian’s. Luscious and floral inspired! You also get a peek at my new apron pattern for Fall! I hope you’ve enjoyed our time together. I sure have……. thanks for spending a piece of your day with me and my dear friends at DIY Style! DIY Gals……….Keep doing what you’re doing and sharing all of your lovely inspiration and ideas. What a fun, creative and loving community we work in! Thank you everyone! You are currently browsing the archives for the Guest Blogger category.